Over the years I have had a couple camp stoves dating back to the old Coleman model whereby you pour gas into a tank and pump it up until your fingers hurt and then try to wash the gas smell off. As an analog adventure that’s as real as it gets. For years at trout camp I would pretend to sleep in so Feral would have to get up first and light the dad-blamed thing. Feral’s an analog guy and I mean that in every good sense of the word. If a gadget has any sort of historical relevance, ambiance, or coolness factor – it holds appeal for him like a moth to flame. For a good example of this – see the post “Feral’s Instruments.” The post talks about his revolving line-up of stringed musical instruments but the lead photo shows a coffee pot atop a backpack camp stove, one of Feral’s revolving line-up of camp stoves. I don’t know who manufactures the stove in the photo but maybe he’ll weigh in with a comment. For some reason, as campers, we took a decade long detour to restaurants rather than crank up a camp stove. 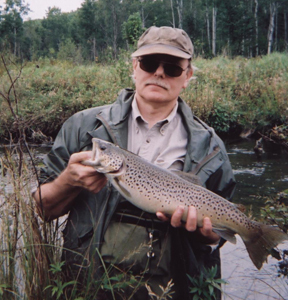 Small town breakfast dives deserves it’s own post, but the point I want to make is we are going back to our “roots” whereby we are at least talking about cooking meals at camp (other than our tradition “Cajun trout and bake beans” final supper at the end of trout season). That’s right, cooking breakfast in the morning instead of running into town like a bunch of tenderfeet. Funny quick sideline – On a family camping trip with my late grandmother, Gladys Lucas, and my parents back in the nineties, my generation jumped into our cars one morning to head for a restaurant. Grandma was up early and saw what we were doing. As we drove buy she shook her finger at us and yelled “You tenderfeet”. So that’s where that came from. Back to camp stove technology. Around ten years ago I found a propane stove that actually made sense in that it was simple, practical and cheap. The magic triad. I am sorry to report that I cross threaded the propane canister on a trip last fall trip and watched it do a slow meltdown when the leaking propane ignited. That said, I blame myself for not being more careful attaching the canister and still stand by the product. The design makes sense in that the canister doubles as a leg of the stove providing a solid base to hold even a large skillet. Clever stuff – maybe I have a little analog still in me. My only qualification is: make sure you thread on the propane canister correctly. You will be amazed by the utility of this product. sixties grandma would cook our meals on a double burner Coleman. 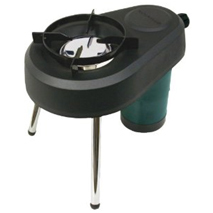 fire up your new propane stove! Feral. You can go to a garage sale or secondhand store and find a Coleman stove or lantern that has seen 10 years of use and 10 more years of disuse, and for 10 bucks and a little TLC you’ve got a piece of equipment that will perform reliably for 10 more years or more. Nice article!